21st September 2018 is being celebrated as Muharram across the world. We dedicate this article to explain to the readers the significance of this festival. Muharram is the name of the first month of the Islamic year. In Islam four months are considered to be the most sacred and Muharram is one of these months. Muharram is a holiday in many parts of the world where the Muslim population is high. It is one of the most significant festivals for the Muslim community. If you translate the word Muharram you will know that it means forbidden. There are two Muslim communities namely Shia and Sunni. The two communities have always existed in the religion for a long time. A Shia and a Sunni can always marry each other. It is true that Shi and Sunni Muslims do have a lot of differences in rituals. The main difference between the two communities is that god appointed the prophet and only god has the right to decide who will be the successor. The Sunni Muslim community fasts on the tenth day of Muharram. The Shia community also does various rituals during the month of Muharram. What the Shia community does on the 10th day is to remember Hazrat Imam Hussain, Hazrat Imam Hussain was the grandson of Prophet Muhammad and he was killed in the battle of Karbala. He fought very bravely against the army of Yazid. He tried all that he could and fought till the last breath to save Karbala. Karbala is a very significant pilgrimage for the Muslims. After his death his family members and followers were marched till Damascus and were imprisoned there. Hazrat Imam Hussain refused to accept the rule of Yazid. He decided to fight Yazid, although he knew that he was outnumbered. He did not surrender till the end and was beheaded. This battle is considered significant as a battle of humanity against tyranny, oppression and injustice. The Shia Muslims want to remember the sacrifices made and mourn on the 10th day of the month. This year this day is 21st September 2018. This day is also called as the day of the Ashura. This day of Ashura is also important for the Muslims because on this day Moses obtained victory over the Egyptian Pharaoh. The community decided that they cannot forget about these events and the generations to come must be told about these. The Shia Muslims ensure that this day is remembered and so is the sacrifice of Hazrat Imam Hussain. They wear black clothes and remember the sacrifice of Hazrat Imam Hussain. They cry loudly and mourn the death of this great leader. They also take out processions on the roads in many parts of the India and other countries of the world. As they remember the sacrifices made by Hazrat Imam Hussain. They walk barefoot on the roads. They also sing sad songs loudly to tell the world about the great sacrifices done in the battle. The mourning starts from the first night of Muharram and it will continue for about two months and eight days. However, nowadays the first ten days are given more importance. On the opening day of the festival the community offers prayers. Muharram is a holiday for the government offices and educational institutes across the country. It is a very significant festival across the country. If a business or a store is run by a Muslim these stores and business may remain close. The processions are huge and many Muslims join in. These processions often become a problem for traffic and as a result we would recommend that you avoid any area that is known to have high Muslim community if you do not want to get trapped in a bad traffic jam. 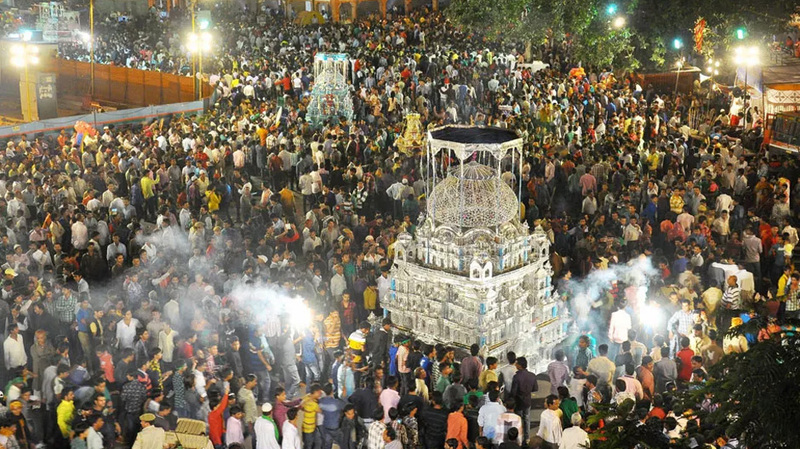 In India Muharram is celebrated a lot in Karnataka, Kerala and Andhra Pradesh. This festival is significant in these parts as the Shia community is more. If you want to get a feel of this unique festival these states can be good idea to visit. The Sunni Muslim community fast on this day. This is because when Prophet went to Madina he saw people fasting on this day. When asked why they fast, he was told because on this day Prophet Moses also fasted because he wanted to thank god for saving him during the war with the Pharaoh. The Shia community do not fast on this day. One controversial ritual that is followed during Muharram is that in some processions young men try to hurt themselves by using blunt swords and chains. This is to show how Hazrat Imam Hussain had suffered before his beheading. It is also done to tell how the followers of Hazrat Imam Hussain suffered after his death. Many Muslims support this ritual as it has been going on for generations and some on the other hand are against it. The Shia clerics are also speaking against this ceremony now as it puts forward a very bad image of the Muslim community and makes Muharram seem like a violent festival. Especially to those who do not understand the significance of the same. Carrying swords in hands in the open and during the day can be seen as very violent. These leaders are saying that this blood should be donated to those who are in need of blood instead of wasting it. This will be a better way to remember the sacrifice of Hazrat Imam Hussain as he had fought for justice and for the well-being of the community. Nowadays this tradition of causing self-inflicted wounds has reduced considerably but is still followed in many parts of the world. Even today in Iraq it is a big festival because it was here that the battle of Karbala was actually fought. The Iraqis cook rice with meat and chickpeas, they give this to those who visit it during the festival. Muharram is thus a very important festival and we have tried to explain the significance of this festival in this article. We hope that after reading this article the readers will get a better idea of what the festival of Muharram is all about and how it is celebrated across the world. Generally when we talk about festival the image is of something happy. Muharram is one of such festivals that are about mourning. It is interesting to know how this festival of mourning started and has survived from thousands of years. Perhaps this message is that we should not forget the sacrifices of great religious leaders who taught us that we must fight for the truth even if we know that the battle is impossible to win.